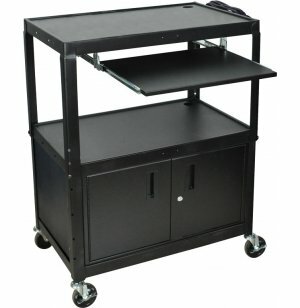 Nail that new business or inspire your students while giving presentations using an AV Cart from Luxor. The sleek, computer-friendly design makes moving equipment around and delivering that perfect pitch as easy as ever. A slide-out keyboard tray lets presenters type comfortably. Height-adjustment capability ensures that the picture is projected in clear, visible, undistorted quality. With your valuable multimedia equipment rolling around on a cart, you want to be sure that it won't become damaged. 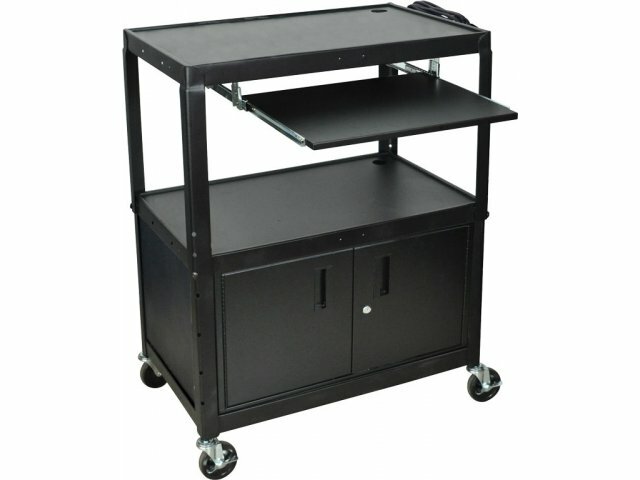 A retaining lip around each shelf of this audio-visual cart ensures that slide projectors and laptops won't slide off. Looking for enhanced security? A locking cabinet protects valuables so you can focus on important business and make the right impression. Comfortable Viewing: Height adjusts from 24" to 42" in 2" increments, so you can make sure that the picture is projected properly. Computer Savvy: Slide-out (18 3/4" x 11 3/4") keyboard drawer facilitates comfortable typing without using up precious shelf space. Power Ready: The 3-Outlet surge suppressing electrical assembly lets you plug right in without hunting for outlets. Wire Management: Cable pass-through grommets in the top and middle shelf make routing wires a cinch. Worry Free: A 1/4"retaining lip around each shelf ensures that equipment will stay in position, even when carts are on the move. Secure Storage: Locking cabinet protects equipment from damage and theft in between presentations. Professional Appearance: The sleek black powder-coat paint finish looks great in the classroom or boardroom.